Can you tell they're potato chips? 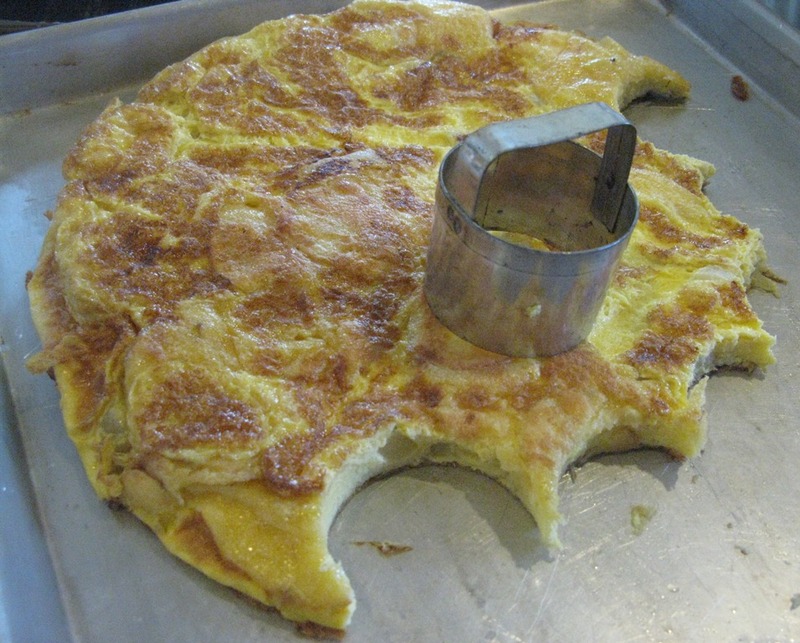 Earlier this year my food appreciation classes spent several weeks in Spain making a variety of tapas, beginning with the grandaddy of all tapas–the Spanish tortilla. 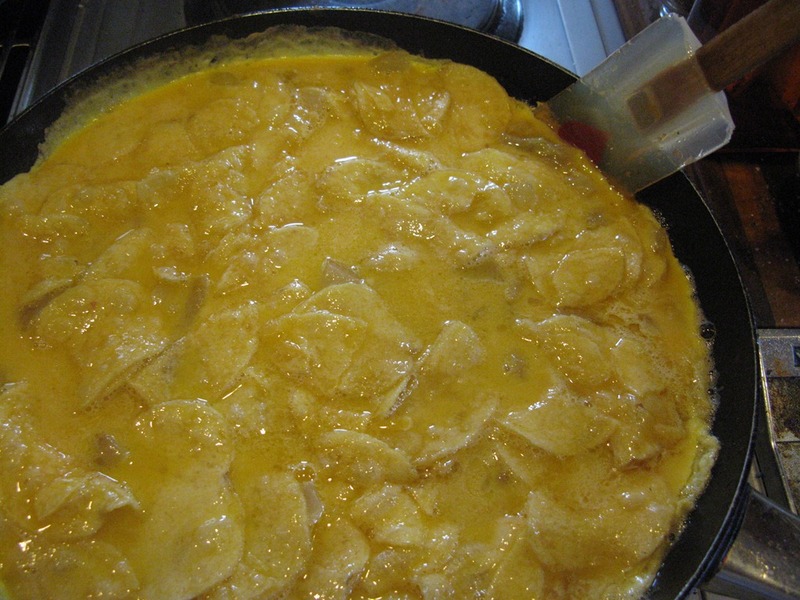 What they call “tortilla” in Spain would be an omelet in France–lots of eggs cooked in a pan with potatoes. First the potatoes are thinly sliced and cooked in the pan, then mixed with the eggs before being poured back into the pan. Getting it right isn’t easy at all. So a light bulb went on when the school nurse informed me that one of her neighbors who happens to work in the kitchen at one of our favorite tapas bars here in D.C. revealed the secret to their Spanish tortilla: potato chips. For our recent parents night tapas bar, I thought I’d try the chip method to make tortillas for 50 people. The results weren’t too bad. I was certainly grateful to skip prepping all those potatoes. But I think my technique needs a little work. The chips tend to float to the top of the eggs, so the tortillas were not exactly infused with potato the way they should be. The solution likely is to use more chips and give them more time to soak in the eggs. But as you can see from the photo, the chips do soften to the point where you’d never know they weren’t potatoes cooked from scratch. To serve them on a tapas buffet for a crowd, I cut the tortillas into small rounds. 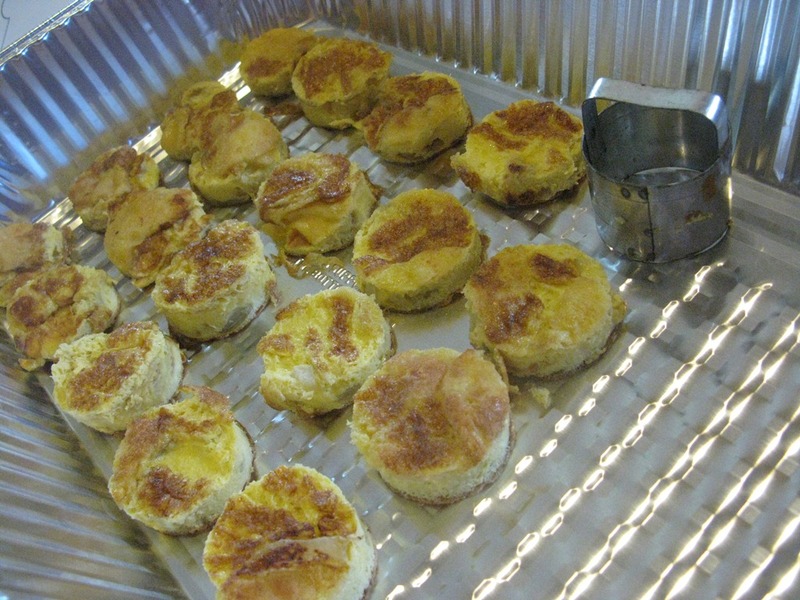 Here’s my caterer’s version of Spanish tortilla, easily made ahead and transported to the job site. Just warm for a bit in the oven before serving. The tapas bar for parents night, by the way, was a great success. The buffet was groaning with platters of delectable morsels: mushroom canapes, roasted vegetable canapes, spinach with chickpeas, tomato and tuna salad, the tortillas of course and a big ceramic oval filled with cassoulet (not Spanish, necessarily, but I couldn’t resist). I spent most of the evening in the kitchen frying squid. Yes, we even had fresh fried calamari. It was a huge hit. Except for some reason most people don’t care for the tentacles. No problem: I love tentacles. It’s kinda like making migas with tortilla chips rather than frying up your own tortillas. I’ve done that in a pinch. The main reason I prefer to fry my own is the oil; I like to fry my chips in tallow rather than soybean oil.